With 100% accuracy and the most frequent update schedule, USgeocoder brings you the best congressional district and representatives data you can trust for the 116th Congress! There are "Congressional District by 5 Digit Zip Code" and "Congressional District by 9 Digit Zip Code" data files in today’s market. Following are the common problems most data files have and how USgeocoder solves them. 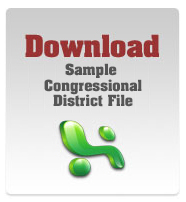 With the USgeocoder Congressional District by 5 Digit Zip Code Data and USgeocoder Advanced Data Analysis Service, you discover exactly how your 5 digit zip codes and congressional districts overlap so you will better understand your needs, allocate your resources more efficiently, and deliver your message more effectively. Congress has divvied up all 9-digit zip codes and assigned them to congressional districts. Our file conforms 100% to these dictates of Congress. We update as soon as Congress declares new Congressional district assignments. Every month, new addresses are created and the US Postal Service reassigns zip codes accordingly. USgeocoder responds to those changes with monthly updates for the closest to real time accuracy available in the marketplace. To maintain the highest level of accuracy, we work directly with the US Postal Office officials responsible for these assignments. As redistricting occurs, we update our congressional district data within 30 days when the states publish the new-redrawn districts. We include the District of Columbia and all US possessions. USgeocoder also offers Congressional representatives contact information with the district data. Congress people's phone and email contact information for main and district offices, committee assignments and staff contact information are updated on a monthly basis. USgeocoder congressional district data is provided in csv format. It works seamlessly with any database, computer or operating system. The data may be purchased by district, state, region, or the whole country. Please contact us for flexible options and pricing details. Contact us to see how we can help you fulfill your congressional district needs.